Peru has another tourist attraction on offer for their visitors. Amid the Peruvian Andes sits the Sacred Valley of the Incas, transected by the Urubamba river that created it and famous as home to the ruins of Machu Picchu. 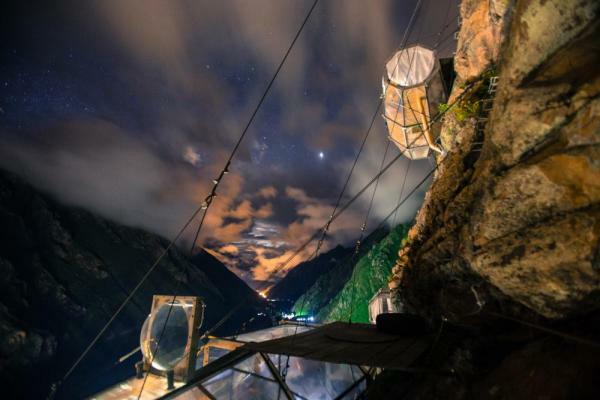 Now you can spend a night here, sleeping in a transparent capsule hanging off the side of a steep cliff, suspending hundreds of meters above the surface. That is exactly the idea behind the spectacular Skylodge Adventures Suites, glass lodges precariously situated on the side of a mountain cliff in the Sacred Valley.